A 55 gallon water container can be a great way to store water for your family in case of a water storage or contamination. There are other options as well, but the 55 gallon barrel is a common one. 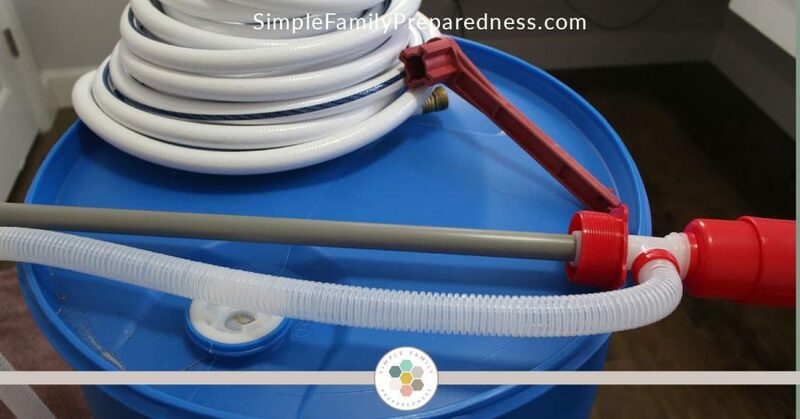 However, even with these barrels being so common, it seems many people are a bit intimidated because they are unsure of the best way to fill up a 55 gallon water barrel. So, let’s make it simple! 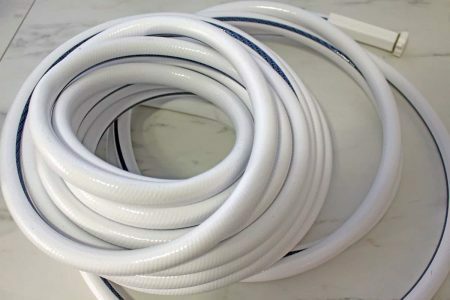 In order to fill up a 55 gallon water barrel, you will need a hose. Option #1 – You likely already have a garden hose. If this hose has been kept and used outside, I do not recommend using it. You will not get perfectly clean water. And if you fill up a 55 gallon water container with dirty water, you will get even dirtier water when you open it back up to use it. Option #3 – A drinking water hose (a.k.a. a boat and camper hose). These hoses are specifically made to handle drinking water. They cost a bit more, but are the best hose you can use to fill up your 55 gallon water container. You can find them a home improvement stores, or HERE are a few options on Amazon. 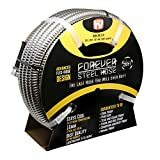 If you don’t have one, you can get one from most home improvements stores, an emergency supply store like Emergency Essentials, or HERE on Amazon. Now that your barrel is open, pour about 1/8 cup bleach in it (a little more or less is fine; this is not an exact science). Add a few gallons of water. Put the bung back on and close it with the bung wrench. Now, roll your barrel around so that the entire inside gets covered with the bleach water. Open it back up and dump out the bleach water. Don’t dump it on anything you don’t want bleached (like your floor) or killed (like your flowers). Down a drain is probably best. Now, before you actually fill up your 55 gallon water container, you will need to take it to where you want it to be permanently. A full 55 gallon water barrel weighs close to 500 pounds. You will not be able to move it once it is full. Do your best to keep put somewhere cool, dry, and dark. If you can’t meet all those requirements, still fill it up–just rotate it more often. You could also put a piece of plywood under it as some people worry about chemicals from the ground leaching in. Personally, I don’t believe that to be necessary, but it certainly can’t hurt. Option #1 – Attach a hose to a potable water source outside. We have an outdoor spicket that provides potable water and others that provide irrigation water. You DO NOT want to fill your 55 gallon water barrel with irrigation water. But if you have a potable water source outside, you can use that. Depending on where you are keeping your barrel, you may need an extra long hose. Put it through an open door or window and then inside your open water barrel. Option #2 – Attach it to an indoor faucet. This is what I do. Since we keep our barrels in our basement under our porch, this option means I can use a shorter (less expensive) hose. Some faucets are ready made to be attached right to a hose. Others will need an attachment/converter. Just let your friendly home store employee know what you are trying to do, and they will help you find the right attachment. And finally, step #7 is where you actually get to fill up a 55 gallon water container! This is the easiest step–just turn on the faucet. I would suggest you have the hose pretty far down inside the barrel. You may also want to have a second person standing there when you turn the water on just to make sure that the sudden pressure doesn’t cause the hose to come out of the barrel. But once it is started, you can leave it for a while. Make note of the time and then come back after a few minutes. Use a flashlight to see how full it is. Then you can estimate how long it will take and get other things done while it fills up. 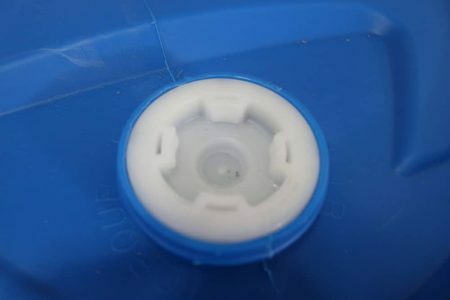 Once you have completely filled up your container, you can add some sort of water treatment. About 1/4 cup bleach will make sure that any bacteria that might have sneaked in during the filling up process are killed. But it will also change the taste of your water. And since bleach has a short shelf life, you should rotate it every year or so–less often if it is in a cool, dark, dry place, but more often if it is in the sun or a hot garage. You can also use chlorine dioxide. My favorite brand it Aquamira. Using this guarantees you a 5 year shelf life–so far less rotation, yay! Plus, your water won’t taste like bleach. But is a more expensive than bleach. I get mine on Amazon HERE. Simple. Use your bung wrench to close up that bung tightly. I got my first 55 gallon water barrel sometime in 2009. I was SO excited and proud that we finally had a significant water storage. We were in California at the time, so no basements. It sat out in the sun on our back porch. Well, time came for us to move, which made me think about how I was actually going to get the water out. (Remember, it weighed nearly 500 lbs. We weren’t going to move it to Utah full). Guess what? I didn’t know how. I know–embarrassing. I tell you so that you know that all of us make mistakes, especially the first time around. 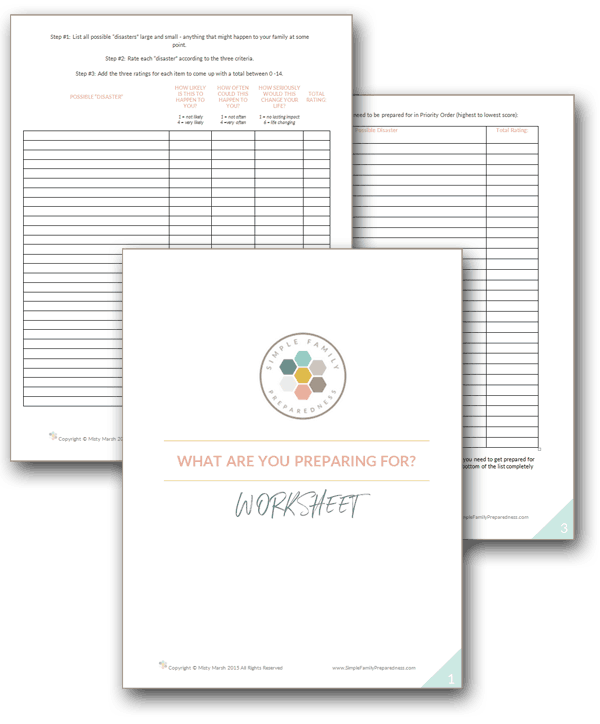 I was new to preparedness and a mom to four kids age three and under at the time. You won’t get things right all the time either–but do something anyway! God will bless you for your efforts. Back to the story: It took two or three men to push the barrel over and dump all the water out. Luckily it was on our porch instead of in our kitchen or something! 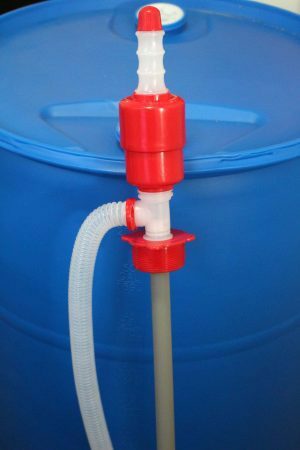 Through this experience, I learned that I needed to have a pump to get water out of my 55 gallon water barrel in a way that I could actually use it (instead of just spilled all over the ground). You can find an inexpensive pump at most home improvement stores, Emergency Essentials, other emergency shops, and on Amazon. This one is affordable and works well. 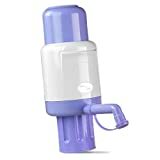 It is a siphon pump, meaning that once you pump a few times, the water continues coming out without you pumping anymore until you stop it. I actually have two in case one breaks. I really want to be able to get to my water! So, there you have it! Seven steps–plus a story and tip–for how to fill up a 55 gallon water container. Any Questions? If so, leave me a comment below! How many tablets for each 55 gallons of water? Put the tablets in when filling up the barrels? I have the exact two barrels, also have the need to move them around in my safe room on occasion so I built a very simple platform to put them on with wheels so they can easily be moved. If interested I can email you a pic of them. Thank you so much… it seems simple, but it’s nice to have the step-by-step. You can get it to siphon up and out your window as long as the bottom of the hose is lower than the barrel – so if you are on a hill and can somehow make the bottom end lower than the barrel it should work. You could also just add the Aquamira and it should get rid of anything in there. I have heard that hydrogen peroxide is a good disinfectant but can’t find any info on how much. (Doesn’t leave a bad taste like Clorox ). Do you know amounts? That is not something I’ve heard…sorry. I also have 55 gallon barrels to deal with. I bought the larger furniture dollies at Harbor Freight and put a board across the middle with blocks underneath for balance in case it tried to tip while moving them. The boards are a few inches longer than the dolly is wide. Simple piece of 2×4 wood underneath each end of the board. Blocks do not touch the floor. The dollies are rated at 1000 pounds. Does the job just fine for a very senior women. I also use these same dollies under all my shelf units of food storage. They work great. Can easily move shelves to clean under them. Everything is in the basement but still need to clean. Great write-up, simple and concise. This is definitely the most practical advice I can really use! Emergency Essentials sell steel barrel caddies that have casters on them to allow for movement, makes filling your barrels easier by being able to move them closer to the water source. And eliminates the need for wood since the barrels are already raised up off the floor. I have purchased several and they work really well. The casters have a lock on one wheel so that once in position they won’t roll around. 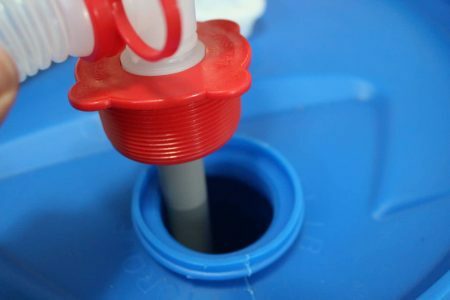 Put the water treatment into the barrel before filling it with water. The turbulence of the stream of water will help mix it thoroughly. Remember to vent the barrel , the water being removed through the spigot must be replaced by air so the water will flow out or your barrel will collapse. Cleanse the spigot and surrounding area before use. Keep plastic barrels in a very dark area or cover them completely with an opaque material. The smallest amount of sunlight will facilitate the growth of algae. Agitate the water periodically by shaking the barrel. This will help keep it aerated and re-disperse any treatment chemicals. Always rotate stored water on a regular schedule. Stop the spread of disease and contamination by not allowing any activities like brushing teeth, shaving, bathing, washing clothes, washing dishes etc. near the water storage. 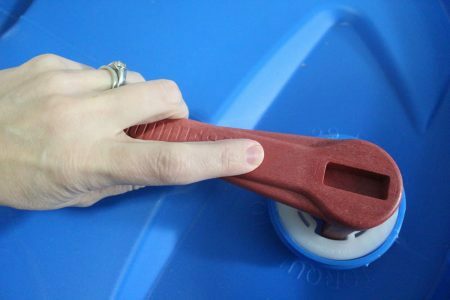 Instead of pushing the barrel over you should have siphoned as much out as you could and then push it over to get the remainder out. 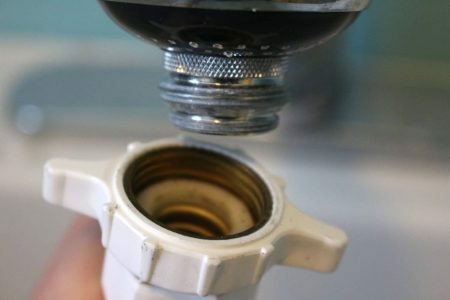 When you buy an RV water hose go ahead and purchase one of the inline water filters as well to filter out any particles that are in the water which seems to always be the case. Thanks for all of the helpful info. Would you mind to please suggest a good resource to actually get a water storage barrel? Sorry, maybe that’s obvious and I just haven’t found one yet. Thanks again! When filling the barrel, do you fill it right to the top, or just to the 55 gal. mark? Ours are stored outside and it gets below freezing in the winter so I wasn’t sure if I needed to leave room for expansion if/when the water freezes. We just got a soft water treatment system from Costco and the Spicket I would use to fill up my barrels is attached to the house so it will probably be soft water. Any suggestions? I do, however, have one hose in my garden area that we will have hard water. I could possibly use that if I were to get two long hoses and attach them together. I have no other place to put the water barrels except on the north side of my house near the house spicier. Don’t really want the added expense of another hose. Why wouldn’t the soft water work? Great help. We have discussed filling our water barrels, but have never done it yet. This makes it easy. NO guess work. Thanks so much. You could also just siphon the water out, Get a hose at least twice as long as the barrel is deep, put your thumb over the end of the hose, to keep the water out. Jam the hose down to the bottom of the full barrel of water, put the end of the hose with your thumb on it down near the ground and take your thumb off. The water should come flowing out and will continue to flow until the barrel is empty, or you get air in the hose. Thank you! Thank you! Mine are sitting out there empty because I never know how to take care of the water.